Australia is currently in the midst of a massive skills shortage, akin to nothing we’ve ever seen before. As you’re probably well aware, the number of new apprentices and trainees has, overall, been in a constant state of decline since 2013. This puts pressure on apprentices and trainees, makes it difficult for businesses to find qualified and reliable staff and puts a strain on a whole range of industries. So how can businesses address the skills shortage in an effective and sustainable way? Before we can address the solutions to the skills shortage, it’s important to analyse some of the stats and understand them a bit better. Firstly, it’s necessary to distinguish between traineeships and apprenticeships. Traineeships are typically related to the service sector – industries such as hospitality, tourism, childcare, IT and retail – and they are in steep decline. Apprenticeships on the other hand, are largely trades – industries such as construction, plumbing, electrical and commercial food production – and these are in decline as well, though much less dramatically than traineeships. The graph below demonstrates the difference between traineeship statistics and apprenticeship statistics. 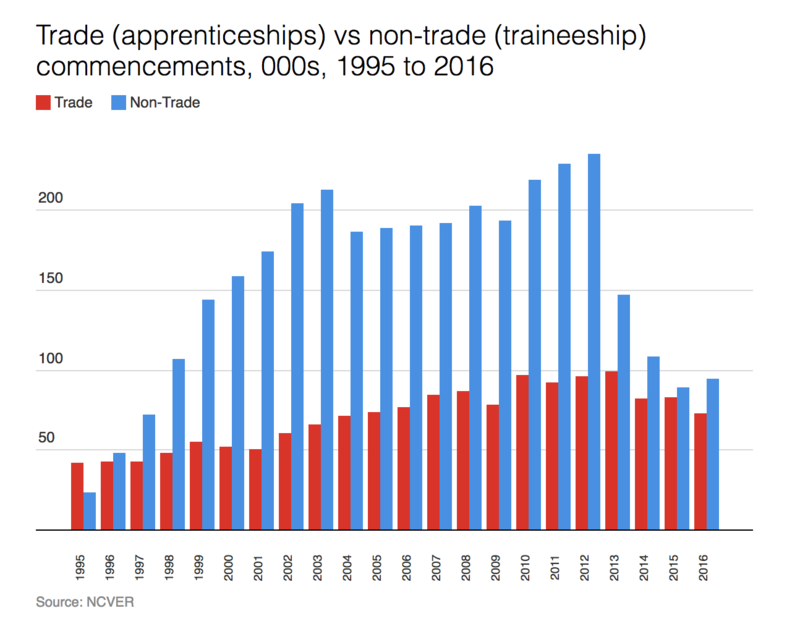 Essentially, the non-trade apprenticeships (traineeships) have dropped rapidly since 2012 and then slightly increased in 2016. Trades, on the other hand, have dropped only slightly. So, the claim that there’s been a 45% drop since 2012 accounts for both these statistics combined. In reality, the situation isn’t as dire for trade-based apprenticeships but it’s much worse for traineeships. While this may be slightly comforting for trade-based businesses and alarming for non-trade businesses, it’s important to know the facts. While the stats aren’t as bad as they looked at first, it’s still the case that trade based apprenticeships are dropping overall or, at best, stagnating. While no one is expecting your business to single-handedly solve the skills shortage, taking on an apprentice is certainly a pro-active way of future-proofing your industry and making your business more sustainable for growth. There are a lot of misconceptions surrounding hiring an apprentice. Business owners often suggest that it’s unaffordable, that there’s a lack of young people willing to work or that they don’t have time to train someone. But for each of these excuses, there are options to suit each individual business. BUSY At Work is a network that connects apprentices with employers at no cost, doing all the legwork to make sure a candidate is the right fit for your business. This is just one example of how taking on an apprentice can be much more viable than it first seems. What happens if the skills shortage gets worse? 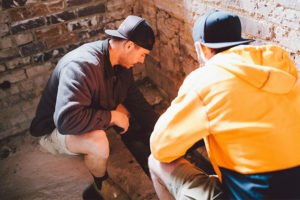 Some argue that the skills shortage is good for business – with less qualified tradespeople, the demand for work goes up and hence businesses can charge more for their services. In the short term this is true. However, looking further into the future we can see this model isn’t sustainable. On a micro scale, some tradespeople might be able to charge more for the same work, but on a macro scale, large commercial jobs are harder to complete on time, staff turnover is unsustainably competitive and Australia will become less competitive in the global economy. Essentially, for the trade sector to grow and develop, businesses of all shapes and sizes need to lend a hand and train more Aussies to work in the industries that matter most. BUSY can help you figure out how to get an apprentice on board with your business. If you’re based in QLD, head here and put in your details.or contact us on 13 BUSY (13 28 79) or 0421 268 884 (text only).